European Central Bank President Mario Draghi defended the euro currency Wednesday and reiterated that "exceptional measures" are justified to stabilize financial markets. In an op-ed published in German newsweekly Die Zeit, Draghi said the euro was launched as a "currency without a state," built on an "institutional framework" that left it vulnerable to crises. Draghi went on to say that the the euro area needs a "new architecture" to complete the monetary union and resolve the region's long-running debt crisis. But he said Europeans do not need to choose between abandoning the euro and sacrificing national sovereignty in a move toward a "United States of Europe." Instead, he advocated for a more pragmatic approach where policymakers "pool" sovereignty in some areas and strengthen democratic independence in others. "It is clear that monetary union does entail a higher degree of joint decision-making," said Draghi. "But economic integration and political integration can develop in parallel." Draghi called for "true oversight" of national budgets. "The consequences of misguided fiscal policies in a monetary union are too severe to remain self-policed," he said. "We cannot afford a situation where some regions run permanently large deficits vis-a-vis others." In addition, he said more needs to be done to increase economic competitiveness and create a centralized banking authority with the power to limit excessive risk-taking by banks. Draghi singled out Germany, saying the eurozone's largest economy has benefited from the single currency and must do its part to support the move toward a stronger economic and monetary union. "Germany needs to remain an anchor of a strong currency, at the centre of a zone of monetary stability and in a dynamic and competitive euro area economy," said Draghi. Some German politicians have argued recently that Greece, the country at the center of the crisis, could exit the currency union without doing too much damage. 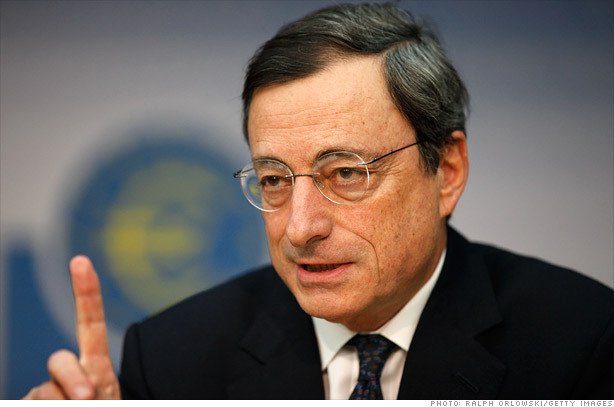 Draghi stressed that the ECB will always act within its mandate to maintain price stability. But he argued that it must sometimes go beyond conventional monetary policies to fulfill this mandate. "When markets are fragmented or influenced by irrational fears, our monetary policy signals do not reach citizens evenly across the euro area," said Draghi. "We have to fix such blockages to ensure a single monetary policy and therefore price stability for all euro area citizens." ECB officials are working on the details of a plan to buy short-term bonds issued by governments that formally request support from the eurozone bailout funds, which would require them to commit to certain conditions. The goal is to ease the pressure on governments that are struggling to cut deficits and stimulate growth simultaneously, such as Spain and Italy. Borrowing costs for both nations shot higher in July, but yields on Spanish and Italian bonds have eased since Draghi said late last month that the ECB would do "whatever it takes" to support the euro. Draghi is widely expected to elaborate on the plan next week, when top ECB officials hold their monthly policy meeting.